Evers-Williams reflects on what it was like to be in love with a great man during an even greater movement. Myrlie Evers-Williams is having an extremely busy year. The 80-year-old former chairwoman of the NAACP and wife of slain civil rights leader Medgar Evers hit the national stage in January to deliver the inaugural prayer at the President Obama’s swearing-in ceremony. Since then, she has been speaking all over the country honoring her husband’s legacy, 50 years after his murder. I met Ms. Evers-Williams earlier this year in Jackson, Mississippi, as part of a commemorative event dedicated to Medgar Evers’ memory. I watched her quietly enter the modest, green-tinted home where she once lived in fear every day, never knowing if Medgar would return alive. Upon first view, the house has no front door, at least not where one should be. I later learned that the entrance was intentionally designed on the left side of the house, constructed in a way where the family could easily drive up, get out on the passenger side, and enter as quickly and safely as possible. But, in the early-morning hours on June 12, 1963, Medgar pulled into his driveway, parking his car directly behind his wife’s. Instead of his normal routine, he got out on the driver’s side. He was met with a gunshot to the back, the force of the bullet propelling his body past his car and hers. He fell at the steps of their home with his keys still in hand. He lived another 40 minutes before dying at a nearby hospital. Standing under a blazing Mississippi sun halfway in that driveway, I imagined his assassin lurking in the bushes that night. I imagined the bloodstains, soaking into the concrete of their driveway. But what I saw most clearly was Evers-Williams screaming over her wounded husband’s body, her eyes searching for a reason why. Sitting together after yet another busy day of speeches and appearances, I chose not to ask her about those tragic final minutes with her husband. Instead, I wanted her to relish in the good times — how they met, their wedding day, having children and how she found a way to be the wife of a man who needed to be much more to so many others. With a deep breath and an honest smile, she began to tell me the story of their love. ESSENCE.com: How did you meet your husband? 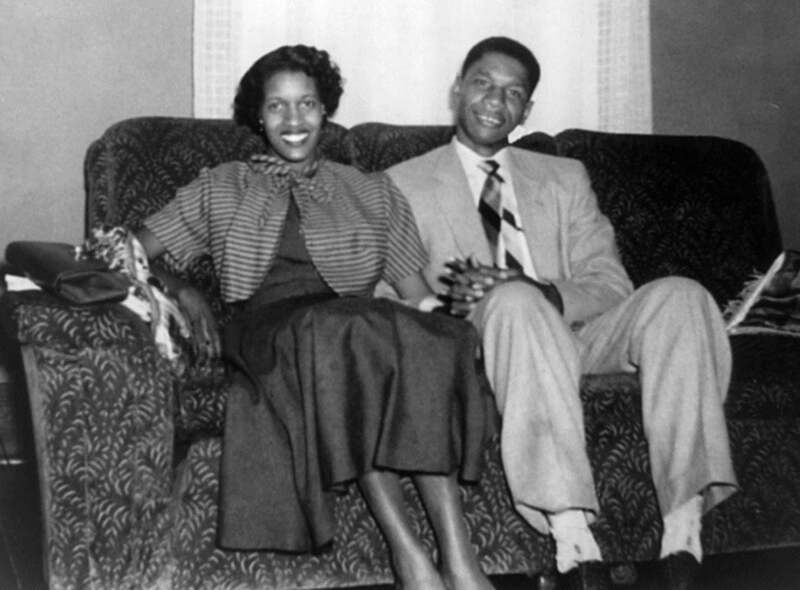 Myrlie Evers-Williams: We met on campus at Alcorn [State University]. It was my first day and my aunt and grandmother saw me safely to my dormitory room, told me they loved me and said, Baby, don’t get involved with any veterans. Some girls got together and walked to a soda place on campus. All of a sudden, we saw these football guys in uniform. They came over and started to look us over. At that point my hair was long and this particular guy said, You shouldn’t lean against that light pole like that; you may get shocked. It was Medgar. God, I remember it like it was yesterday. ESSENCE.com: Was it love at first sight? Evers-Williams: I was very curious about him. We saw each other in passing at school, particularly at the gymnasium, which was also our food service area. One day he asked me to sit with him, saying, I just want to talk. I thought, Fine, there’s no harm in talking. He proceeded to tell me — and I quote — “You will be the mother of my children.” I was 17 years old and had barely even dated. ESSENCE.com: And exactly how old was he? Evers-Williams: Twenty-five! Oh, the girls loved him. He was very popular on campus. He was not a party person, but he was a superb dancer. ESSENCE.com: You got married almost two years later. What was your wedding day like? Evers-Williams: Nerve-racking, because we had a major argument the night before. I don’t remember what it was about, but I remember having this sick feeling, thinking, This wedding is not going to come off. We’re not going to make it. Coming down the aisle, looking at each other, it was sort of like, Which one of us is going to turn around and walk away? Neither one of us did, of course. ESSENCE.com: What kind of father was he? Evers Williams: Absolutely fantastic! Medgar was very attentive and patient. When he didn’t like something, he would raise his voice but not in a yell…just enough to let you know he wasn’t pleased. He was very fair with the children. He purchased a football for our first child when he found out it was a boy and brought it to the hospital. He was a superior parent [especially considering] the stress that he was under. He instilled in them a sense of community, helping others, and to accumulate as much knowledge as possible. He took time to explain why he was doing the work that he was doing, pointing out things such as their inability to go to public pools, movies, restaurants, libraries etc. and he would always say, I pay taxes and I should not have to if I cannot use these facilities. He also taught them survival skills — where to sit, where not to sit, what to listen for, what to do if someone fired into the house, and that’s exactly what they were about to do the night he was killed. They were supposed to go to the bathroom and get in the tub, but my screams stopped them. ESSENCE.com: Did his commitment to the Civil Rights Movement ever become a problem? Evers-Williams: Medgar and I discussed the amount of time that he was away from home and the need for our children to have him there more. I remember saying, Something has to change, because I can’t take it anymore. We need you. And with a very solemn look, he said, Myrlie, you have to make a decision. Either you’re with me or you aren’t. The NAACP, the Movement…they were the “other woman” in my life. So when it comes down to love and working together, you make a decision as to what you can tolerate and what you can build on. There was no way that anything was going to separate us but death. We were partners all the way through. ESSENCE.com: What’s one of your fondest memories of him? Evers-Williams: The night before he died, we talked and reassured one another that things would be all right, but we knew we were lying. I tried to bring as much comfort, peace and support as I possibly could to my husband. And that last night together I asked him what could I do to make things better. He said, Just keep doing what you’re doing. But I also remember him saying at one of the last rallies he attended, I love my wife and children. I will do whatever necessary to see that they have the best life that they possibly can, not only for them but for all of the other women and children as well. He felt strongly enough in his work to lift up everybody, not just a few, and to me that was the greatest gift of love that he could ever give.